136 Golf Village Boulevard Jupiter, Fl 33458 has been sold. CUSTOM DESIGNED SINGLE FAMILY HOME ON A VERY PRIVATE 1.5 LOT WITH GORGEOUS VIEWS OF LAKE & GOLF COURSE. WOLF GAS STOVE AND EXHAUST, SUB ZERO REFRIGERATOR AND WINE REFRIGERATOR 2 YEARS OLD, DOUBLE BOSCH WALL OVENS, BOSCH DISHWASHER, GENERATOR FOR ENTIRE HOUSE, PHANTOM SCREENS ON PATIO, FRONT DOOR AND GUEST BEDROOM DOORS, IMPACT GLASS ON MOST WINDOWS, TANKLESS HOT WATER HEATER, HEATED POOL & SPA, SUNBRITE SILICONE APPLICATION TO ROOF IN 2017, PRIVATE COURTYARD PATIO OFF GUEST BEDROOM. IMPECCABLE & IMMACULATE FOR THE MOST DISCRIMINATING BUYER!! 136 Golf Village Boulevard located in Jupiter, FL is a single family home with 3 bedrooms, 3 full baths and 1 half baths.The Home at 136 Golf Village Boulevard was built in 1996 in Admirals Cove and offers a 2.5 car garage. This Admirals Cove Home offers golf course, clubhouse. 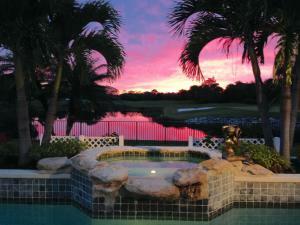 136 Golf Village Boulevard Jupiter, Fl is currently listed for $950,000 under the MLS# RX-10493738. This Home has been put on the Jupiter MLS system and currently has a status of SLD. Admirals Cove in Jupiter is really a wonderful community in a great city. If you like the beautiful Jupiter location but you are not sure about this community. You might like one of the other local communities like Bamboo Point or Waters Edge or Jupiter Inlet Cove or Jupiter River Estates or Carmel Landing that are located here.